Does Wine Get Better With Age? All my life, I’d heard that wine gets better with age. The myth is perpetuated through the exorbitant prices people pay for certain bottles of aged wine. The truth is, some wines do improve with age, while others reach their peak within 2-3 years. We decided to find out for ourselves when my parents stumbled across a couple of bottles of wine they had bought in the mid-1980s. This didn’t merely make them “aged,” but downright old: 30 years is a long time to wait to open a bottle of wine. Would it still be drinkable, let alone good? We were soon to find out, and turned the whole experience into a food challenge: determining whether wine really does improve with age. The ancient Greeks and Romans prized aged wines, often storing them in sealed earthenware jugs where they would keep for many years. After the fall of the Roman Empire, wines were paler, light bodied, and lower in alcohol content. These did not age well and would turn to vinegar after a few months, so old bottles were steeply discounted. In the 17th century the cork and bottle were invented, and wines were being produced with a higher alcohol content, two factors leading to improved preservation and aging. Today, it is estimated that only 10% of red wines and 5% of white wines improve enough to taste better after 5 years of aging, and only the top 1% of all wine tastes better when it’s a decade old. Wines with the best potential for aging have low pH levels and a high amount of tannins, meaning reds such as Pinot Noir, Cabernet Sauvignon, and Syrah. We were not really looking forward to this challenge. We had my parents over to participate, since they are pretty knowledgeable about wine. They had opened old bottles before that had gone sour and tasted like vinegar. Our hopes were not high, putting it lightly. 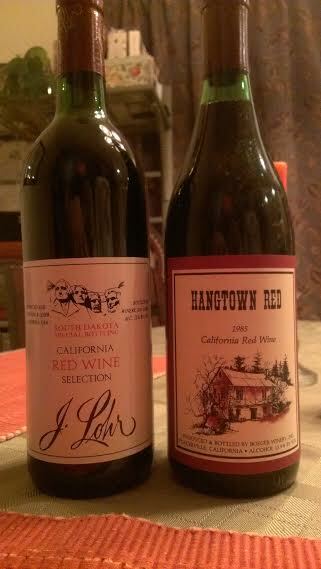 The wines we tried: a 1985 Hangtown Red California Red Wine, and a J. Lohr California Red Wine that had been purchased in South Dakota sometime between 1983-1986. So, two 30 year-old bottles of generic red wine awaited our palates. Right on! We ran into trouble almost immediately. 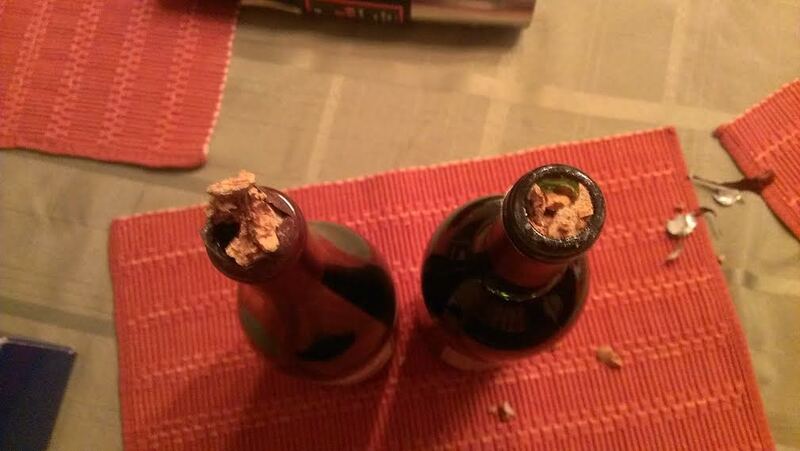 Both corks splintered when we tried to remove them. To properly store wine, you are supposed to lay the bottle on its side and give it a quarter turn every couple of months. These bottles were sitting upright in a box for decades, and so the corks had long ago dried out. This can lead to oxygen leaking into the bottle, leading to an off-taste (at best) and mold (at worst). Still, we didn’t let a little thing like crumbling corks stop us. We soldiered on, eventually prying one cork out and pushing the second cork into the bottle. Luckily, we had a strainer. Where there’s a will, there’s a way. We poured the wine into glasses. For comparison and contrast, we had a “fresh” bottle of wine, as well. The first thing we noticed was the difference in color. The “new” wine was bright, almost purple in color, while the older wines had faded somewhat to a brownish-red color. The corks had crumbled and were difficult to remove thanks to improper storage techniques. Now it was time for the ultimate test: the tasting! Everybody seemed reluctant, so I picked up the glass of J. Lohr California Red and took a deep swallow. Fortunately, not only had it not oxidized or turned to vinegar, it was actually pretty good. For a cheap red wine that was 30 years old, anyway. It tasted to me of prunes. The others followed suit – Tara and my parents – and we all agreed. We were pleasantly surprised. The second glass, the 1985 Hangtown Red, was pretty similar. I thought this one had more of a smokiness to it, but it was certainly drinkable, if not delicious. Again, everybody took a sip or two. Again, we were all surprised. “You know,” I said, “If you were trapped on a deserted island and these two bottles of wine washed up on shore, you’d be thanking your lucky stars,” I commented. “You’d be smashing them open by the neck to drink them,” my dad countered. So, there you go. I don’t know if this challenge was the exception or the rule, but our well-aged red wines – while not necessarily improving in flavor – didn’t really suffer all that much. In fact, I ended up finishing the entire glass of J. Lohr. I’ll admit: I actually liked it! 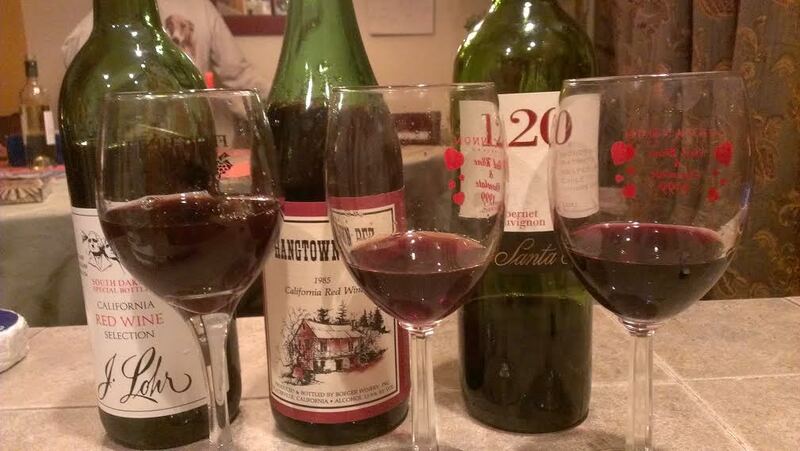 L to R: J. Lohr CA Red (circa early-mid 80s), Hangtown Red CA Red (1985), 120 Cabernet Sauvignon (2011). How Long Can You Keep Red Wine For?